As Carrie Underwood took the stage to sing "Two Black Cadillacs" on Sunday night, Grammy fans noticed something strange was happening to her dress: the seemingly white gown started to light up with a variety of holographic patterns. Carrie Underwood's dress in its many different projections. The singer's outfit went through a series of striking changes, including turning a brilliant blue and a vibrant red as it cycled through different designs. 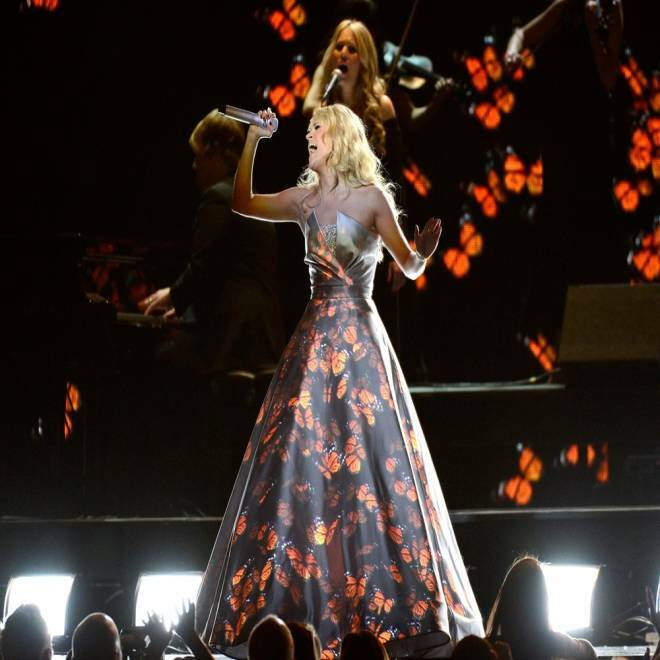 In one of the looks, Carrie Underwood's dress took on a rose pattern. Some fans compared Carrie's looks to the animated blue Na'vi from James Cameron's film "Avatar." Audience reactions ranged from confusion to compliments to Avatar comparisons to downright anger from some fans, who thought her attire was offensively unappealing. While we're still not sure what the science was behind the dress, we're sort of still speechless over the look.